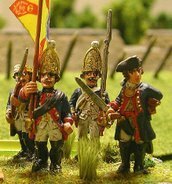 A blog for Allan (AJ) Wright's wargaming endeavours. Cowpens-Guilford Courthouse Campaign Refought: Battle of New Garden Meeting House. Pats Win SB LIII, 13-3! This is the next unit I've painted for my 28mm Carthaginian army. In Field of Glory this is a single unit of medium infantry. In Hanibal at the Gates this becomes four units of the 'soldier' unit type as seen below. These are all Old Glory figures from two separate packs. The figures in metal helmets are from their Scutarii pack and the more characteristically Spanish leather helmets come from their Caetreti pack. The shields are hand painted. Originally I was going to feature a more purple striping on the tunics and shields, but in the end I settled on the dark red that most other wargamers use. The figures were 'dipped' using army painter strong shade. The spears are from Warlord Games. Next up are some Carthaginian generals that are painted but awaiting dipping and basing. Following these will be some Campanian hoplites that are currently on the painting table. If you're following my blog be sure to scroll down for two additional posts I've made today. Excellent. Top job. I like them a lot. Got to love that Army Painter stuff. It works a treat. Galpy said.... "selling my 28mm Crth army". Email sent Kent. Splendid! The shield colors are really impressive!